We take the rough with the smooth here at Iron Fist – you cannot have one without the other. And with every celebration there is an element of tragedy, or for the optimists there is a cause for celebration in every moment of sadness. 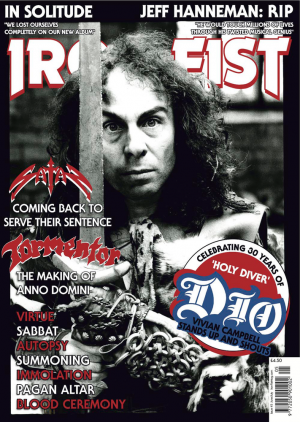 We started Issue 5 of Iron Fist in a celebratory mood – one of metal’s most important albums – ‘Holy Diver – was about to turn 30, but in talking to lead guitarist Vivian Campbell we learned how miserable the making of that landmark record made him, spilling the beans of the well-documented fall-out between him and Ronnie James Dio. We also wanted to celebrate the life and music of one of metal’s most important guitarists, Jeff Hanneman – Reign In Peace! But most of all we wanted to celebrate tenacity and perseverance, a thread running through interviews with Hungary’s underground cult thrashers, Tormentor and underrated NWOBHM heroes, Pagan Altar, Satan and Virtue. While Tormentor, Pagan Altar and Virtue were noticed long after they’d called it quits, Satan journeyed through the hard times through many guises before reforming under their original name and making one of the albums of their career. In this issue we also speak to lifelong metal veterans Immolation and Summoning – from different ends of the musical spectrum perhaps, but both with a burning passion to create music with an eye to the future, but respecting their legacy. We also spoke to bands just starting their journey, such as Lantern from Finland, Vemod and Eldkraft from Sweden and The Oath from Germany and bands continuing on their own paths; Spiritual Beggars, Evile, Blood Ceremony, Entrails and more. Plus there’s all the usual album reviews, gig reviews and a double Japanese attakk from Sabbat and Church Of Misery. Dio once said “You’ve got desire, so let it out” and all the bands in this issue of Iron Fist are doing just that!